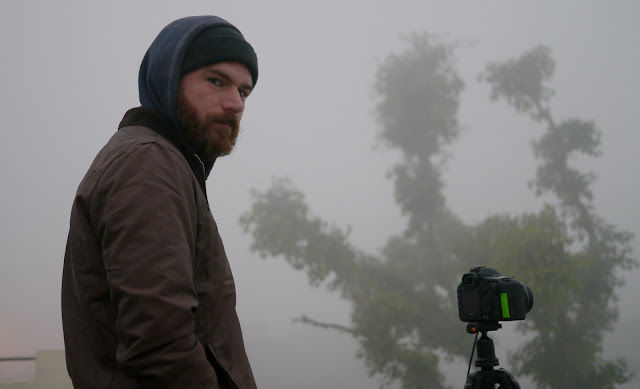 The fog delayed trains, ruined views and cancelled the sunrise. Matt persists, but is disappointed by the sun's poor showing. Our charging rig, the lights dimmed when we plugged stuff in. 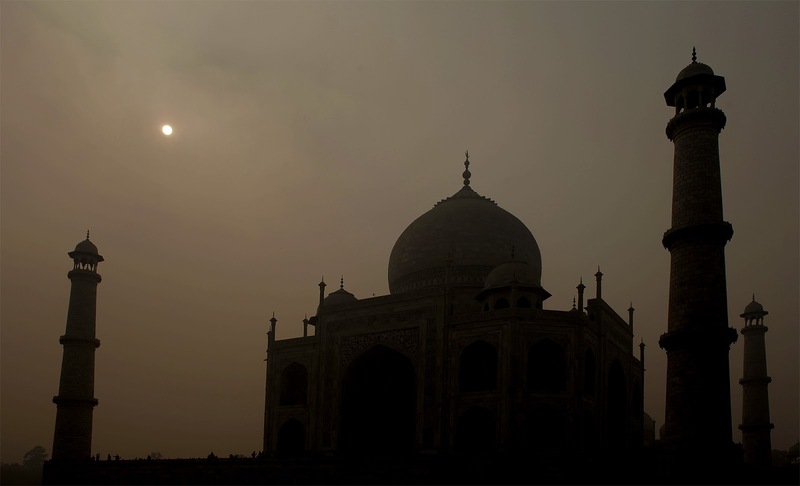 Finally the Taj makes her appearance, fashionably late. Ceiling detail in the red sandstone Jawab next to the tomb. 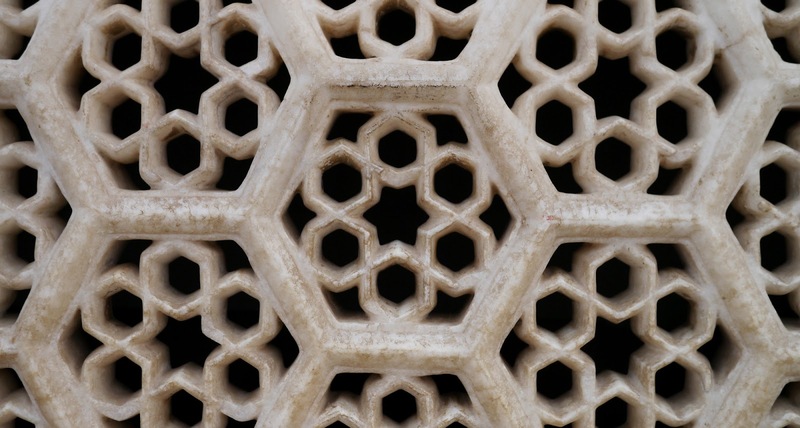 Marble lattice work on the rear wall of the tomb. Monkeys on the roof at sunset. One of the bad things about travelling in high season, between two of the the most popular tourist destinations, is that your spontaneity is severely curtailed. There were no train tickets to be had (and Kumbha Mela in Allahabad hasn't even started! google it), not even tourist quota, and it was too cold and too long a trip to squeeze into the general seating. Who are we kidding, wimpy westerners don't have what it takes to travel unreserved 2nd class. We broke our own rule and settled on a flight, which was the same price as AC2 on the train, and saved us 10 hrs travel time. Unfortunately it now means we need to sit down and do some serious planning so we get the train tickets we want. Not cool man, not cool. 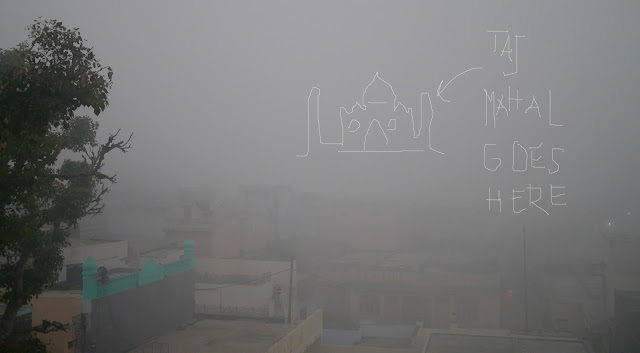 The fog and the cold weather in Agra were definitely a bummer at first. But the Taj is impressive no matter what the circumstances. And when the sun came through, it was breathtaking. 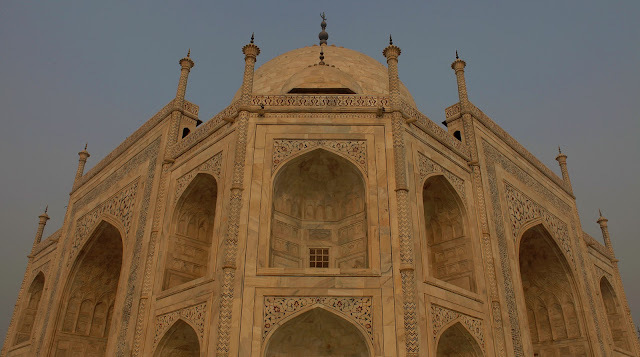 Unfortunately, I came down with a cold or something and we ended up staying in Agra without seeing much besides the Taj. But I suppose being forced to look out at the Taj Mahal for a few days is not something I should complaint about, even if I feel crappy.